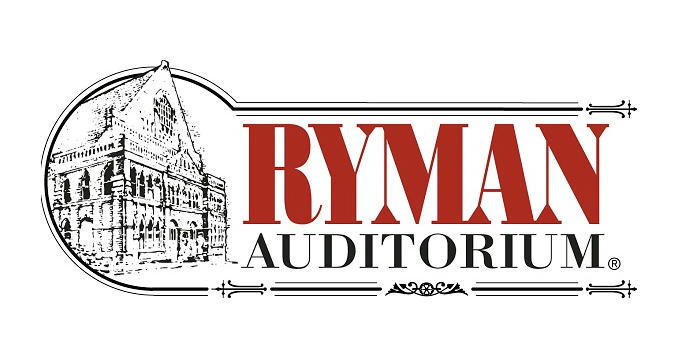 The renowned Grand Ole Opry celebrated Christmas (December 25, 2015) at the Ryman Auditorium in Nashville, TN with a concert featuring Opry members and special guests. The Grand Ole Opry is the show that made country music famous. It started as a radio program back in 1925 and it is still going strong spreading the gospel of contemporary and traditional country music. 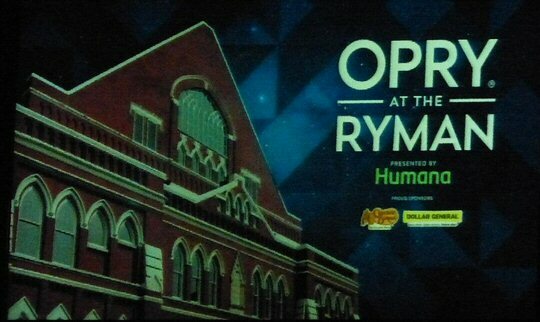 The Opry broadcast can be heard worldwide on Nashville’s 650 AM WSM, Sirius XM, Opry.com and more. The Grand Ole Opry returns every year to the Mother Church of Country Music. Along with the traditional Opry barn as the backdrop there were a few Christmas decorations around and on the Ryman stage as hostess Jeannie Seely started the show off with a snappy country song. Jeannie aka Miss Country Soul has been a distinctive voice of the Opry since 1967. The Grammy-winning singer has said that “I feel very fortunate to be part of the Opry tradition and I truly am indebted to all the wonderful fans that have supported me over the years.” Seely was in good spirits and voice throughout her portion of the Opry program. Ms. Seely gave a warm introduction for Wade Hayes who performed the personal and profound “Go Live Your Life”. Wade has a rich baritone voice well suited to the more traditional type of country music that he appreciated as a youngster and emulates as an artist. Wade paid tribute to the greats of the past with a compelling version of Merle Haggard’s “If We Make It Through December”. It was classic country-hard times storytelling. “God Bless and Merry Christmas” stated Wade as he concluded his set. The Grand Ole Opry concert is a live radio broadcast which means announcer Eddie Stubbs read a number of promos from the show’s sponsors which on Friday night included Boot Barn, Dollar General, Cracker Barrel and Humana. The ads also allow for quick stage changes since a multiple of artists perform at each concert. Jeannie gave another warm welcome to Jesse McReynolds and The Virginia Boys. Jesse aka Mr. Mandolin is known for his unique cross picking and split string style of playing. He was inducted into the Orpy in 1964 and he is still fluid. McReynolds with The Virginia Boys presented a beautiful yet innovative bluegrass interpretation of “What Child Is This” along with a layered and lively instrumental. 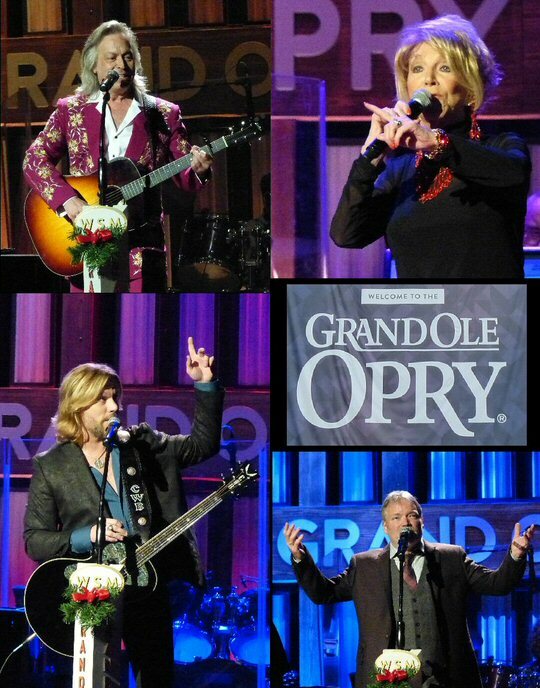 Clockwise from Top Left: Jim Lauderdale, Jeannie Seely, John Berry and Craig Wayne Boyd. Jim Lauderdale is a master player and songwriter. Jim dressed and sounded like a true country gent as he delighted fans with “I Love Your More”. He shared that there was no better gift than being here at the Opry. Jim made it a point to introduce the Grand Ole Opry band before encouraging us to do more to make the world a better place with “You Got A Way All Yours” a song inspired by George Jones. John Berry with his band which included family members presented two incredible Christmas carols “Oh Come All Ye Faithful” and a heavenly “O Holy Night” that received a standing ovation. The next set started and was hosted by Riders In The Sky who have been described as “hats and shoulders above the rest in the comedy-western genre”. They can also say they have been Opry members since 1982. They were dressed in colorful cowboy costumes with one of them sporting a cactus tie but Riders In The Sky are no joke as they can sing, strum and even yodel with the best of them. Ray Pillow another Opry member was engaging as was Craig Wayne Boyd. Many may know Craig as season seven’s winner on The Voice. “I’ll Be Home for Christmas” and “Silent Night” were both well played by Boyd and well received by the Ryman audience. Riders In The Sky finished up their segment with a signature “Happy Trails” declaring “may the horse be with you” a nod to the latest Star Wars movie that came out in December of 2015. Hosts Larry Gatlin & The Gatlin Brothers were celebrating their Grand Ole Opry anniversary. They were inducted on Christmas Day back in 1976. Their three rich voices blended beautifully separately and together during “Silent Night”. Bobby Osborne & The Rocky Top X-Press were legendary and lively followed by singer Mandy Barnett who beguiled the crowd with a winsome rendition of “Winter Wonderland” and a spot-on “Crazy” by Patsy Cline. The Gatlin Brothers closed the concert with a crowd pleasing “All The Gold In California”. There is no better way for country artists and fans to spend Christmas Night but at the Grand Ole Opry. So many of the long standing members still had great things to say about the Opry stating in their own words that it is a honor to grace the Mother Church’s (Ryman) stage. The Grand Ole Opry gives the gift of music multiple times every week of the year with ever changing line-ups. Please check their website for upcoming events including venue tours. Riders In The Sky and The Gatlin Brothers celebrate on Christmas Day.